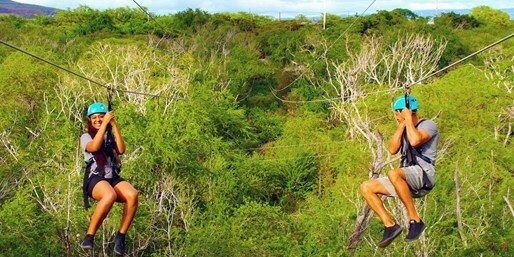 On this Zipline tour, your guides will lead you through six ziplines ranging from 300 to 900 feet! This is a perfect tour for those looking to experience a safe, adrenaline pumping, high flying experience. This tour is great for all, from families looking to have a memorable time together, to couples seeking that moment they will be talking about for years to come. These ziplines feature the most modern braking system which means that zipliners do not need to control their speed or stop themselves, allowing for all ages and abilities to take part in this activity. Expert guides will be with you throughout the adventure, so leave your worries at home and come on out for an experience you'll never forget! Children between 40-60 lbs. can still participate by zipping tandem with a guide. Transportation is provided with purchase of ticket.